It is always a pleasure to take a dive into the Paris wine scene, also because it naturally is different than the scene in Germany and other countries. 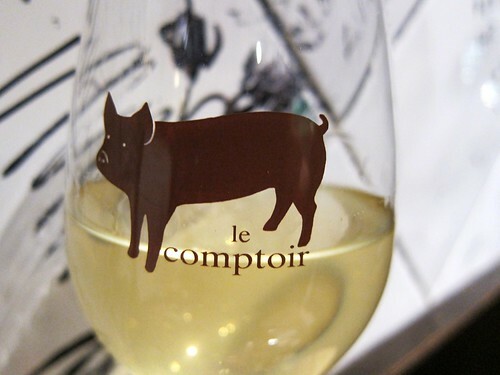 At the moment, wine bars in Paris are driven by the Vin Naturel craze and the hunger for organic and farmed produce. 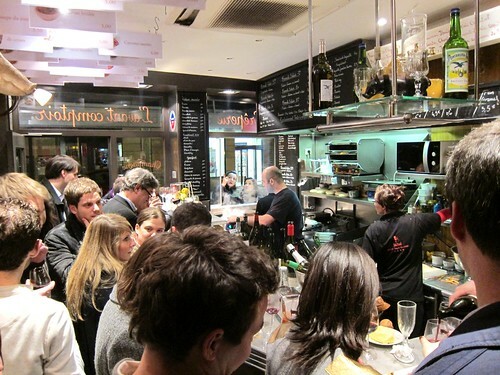 Our first stop (in a wine bar) on that March weekend was at L’Avant-Comptoir, this narrow, standing-only bar adjascent to Le Comptoir, Yves Camdeborde’s acclaimed restaurant and which are both located in the ground floor of his hotel, the Relais Saint-Germain. 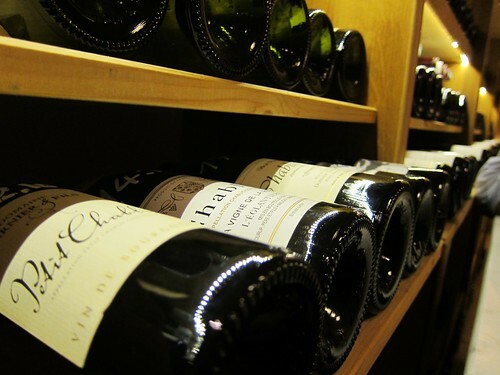 The wine-list features a good dozen or more natural, biodynamic or organic wines by the glass, all from France. Besides this Southern-French white (forgot which one) I of course also had a glass of Morgon by Mathieu Lapierre, which is being poured from the magnum bottle. A delicious treat! 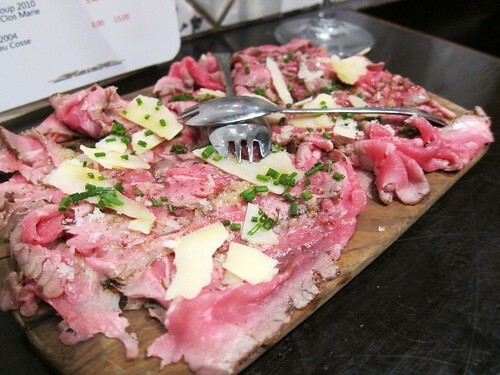 The small bites, such as this slightly seared veal Carpaccio, are delicious as well, but you have to be prepared to eat while being sandwiched within the crowd. A great wine-party atmosphere! Now if you cross the street from L’Avant Comptoir and walk along Rue des 4 Vents, you’ll end up in front of La Compagnie des Vins Surnaturels. This is probably the hippest wine bar in the area, obviously more chic than l’Avant-Comptoir, with dark woods and elegant furniture. 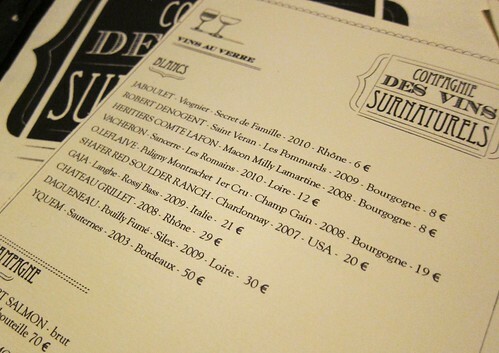 But the winelist is much bigger and offers an incredible mix of “supernatural” wines, not only from France. 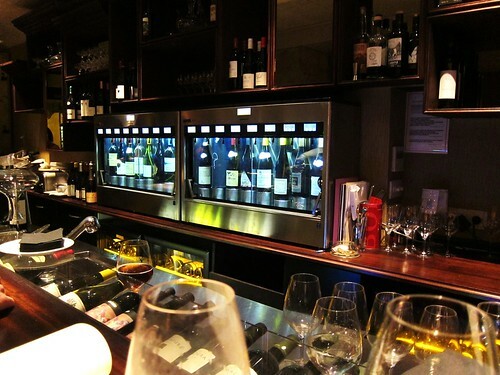 The highlight is the selection of wines by the glass which comes from the Enomatic machine. That evening, I had a wonderful glass of Macon Milly Lamartine by Domaine des Comtes Lafon, with an intensily aromatic nose and crisp body. The enomatic also contains one “mystery bottle”: if you guess the wine (one from the list), you win the whole bottle. We tried. We failed. But the night wasn’t over yet, especially as we realized that our dinner wasn’t substantial enough. 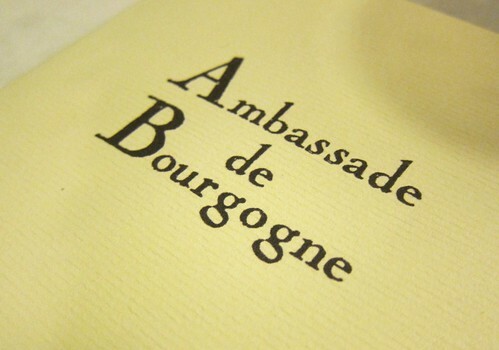 Luckily a few meters down rue de l’Odéon we found “L’Ambassade de Bourgogne“, a very calm and rather un-hip store and wine-bar, but with a fabulous selection of bottles from all over Burgundy. And at first it was pretty hard to pick one with so much choice, but thanks to the owner’s help we finally found what we needed. We opted for a bottle of 2009 Mâcon-Pierreclos “Le Chavigne” by Domaine Guffens-Heynen which proved to be a very complete wine, firm and juicy at the same time, with great aromatics and genuine depth. A winner-recommendation! 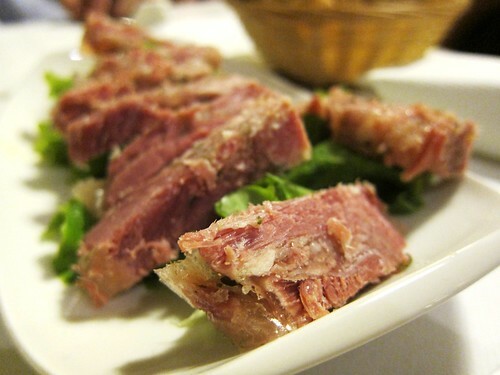 The wine was a great match also with the jambon persillé made with Marc de Bourgogne. What a freshness! But the night still wasn’t over. 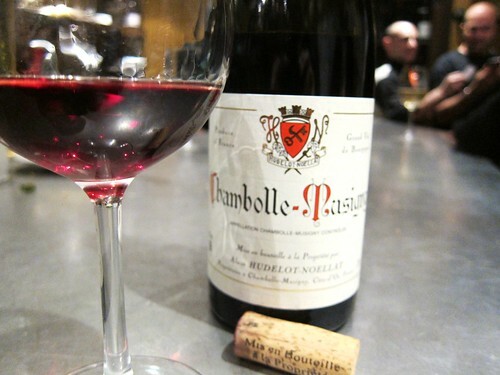 We took along a bottle of 2007 Chambolle-Musigny by Domaine Hudelot-Noellat, and on the way to the metro, traded in a pour for the L’Avant-Comptoir crew in exchange for lending us some glassware. What a great wine by the way! So fruit-loaded and charming and with perfect balance and juiciness. The bottle emptied itself in no time. Apparently 2007 is said to be a weaker vintage in Burgundy, but this bottle is worth every penny and drinkable right now (and later). 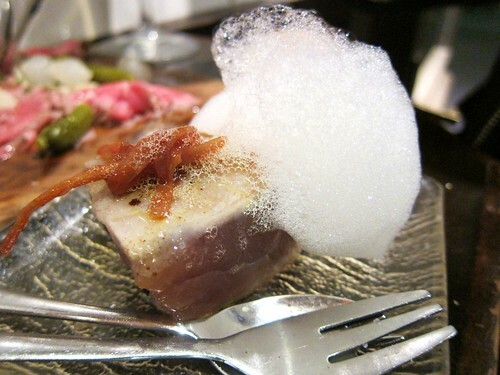 La Crèmerie is definitely part of the Saint-Germain wine bar scene, you’re right, Christian. And we even walked past by it as it is exactly halfway between l’Avant-Comptoir and La Compagnie des Vins Naturels. However, it seemed to be quite full already, so we went on. Thanks for your tips on facebook back then! La Cremerie is where I sometimes go to buy my wines (especially the Rheingau Kuehn), but I haven’t ever actually eaten there. So many good places in Odeon! See how good I am at multitasking! Was a fun evening and I was really lucky the camera didn’t break!